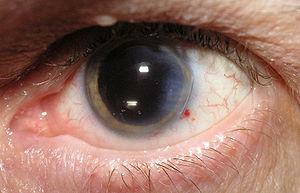 A cataract is an eye condition affecting the lens. The lens is normally transparent allowing light to enter the eye and eventually reach the retina. In people suffering from cataract the lens loses its clarity and becomes cloudy or opaque. Because of that the retina of the eye cannot receive light any more and one may even end up blind. The condition can be congenital or acquired. Still, it is most commonly associated with the process of aging. In the majority of cases cataract affects both eyes. The only way to help patients suffering from cataract is to surgically remove the affected lens and replace it with an artificial one. Many patients explain that they feel like looking through a dirty windshield of a car. Vision changes occur gradually, but they all eventually cause blurred vision, difficulty with glare (especially with bright sun), dull color vision and double vision generally affecting one eye. People who wear prescription eyeglasses for nearsightedness may notice vision deterioration as well. Fortunately, apart from vision problems, patients do not experience any pain or discomfort. There is also no inflammation of the eye or nearby tissues. Cataract surgery is always performed by an ophthalmologist. The very procedure includes resection of the front part of the eye, removal of the affected lens and its replacement with a new, artificial lens. The cost of the surgery basically depends on several factors such as the type of the lens used as a replacement, the type of cataract etc. There are several methods and approaches surgeons may opt for and these also influence the total cost of the procedure. As far as India is concerned, the cost of cataract surgery in this country has significantly dropped. This surgery is quite affordable for many foreigners which actually chose to go to India in order to be operated. The cost of the surgery, for instance, can be easily combined with the cost of the holiday. This is the reason why India becomes more and more popular particularly in the sphere of medical tourism. It is estimated that the cost of cataract surgery in this country ranges between Rs 8000 and Rs 15000. The prices may even be a bit higher which generally depends on the city where the surgery is preformed as well as the hospital the patient is going to stay in. Surgery may even reach Rs 35 000 but only if patients opt for the most expensive artificial lenses available. Finally, apart from cataract surgery, well experienced Indian eye surgeons may also offer a set of other eye surgeries such as refractive surgery, corneal surgeries etc., all of which are much cheaper comparing to other countries.